Concerned Citizens of Abra for Good Government (CCAGG), a local CSO, set out to strengthen and enhance the transparency and ethical standards within the agencies involved in the water and irrigation systems sector in the Abra province. Key objectives of the “Abra Water and Irrigation Systems (AWIS) Watch Project” included improving public awareness on the extent of corruption affecting the water and irrigation system projects in the province and enhancing the capacities of CSOs, beneficiaries and communities in planning, implementing, monitoring and evaluating water and irrigation system projects. 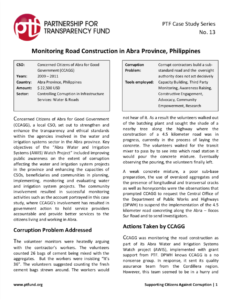 The community involvement resulted in successful monitoring activities such as the account portrayed in this case study, where CCAGG’s involvement has resulted in government action to hold service providers accountable and provide better services to the citizens living and working in Abra.